Beginning in 1973 (I believe), at Nova Middle School/High School, Marvin Hinshaw oversaw an experimental advanced math program called Elements of Mathematics, which combined advanced math and formal logic. A very high percentage of the students who participated in the EM Math program, which ran from 6th grade through 12th grade, eventually became very successful in their endeavors post high school. Many of those students attribute much of their success to Mr. Hinshaw and the EM Math program. I know this because I am one of those students. Whenever I come in contact with former classmates who participated in EM Math, Mr. Hinshaw is the most common topic of conversation. In fact, this email is as a result of an email sent to me from Seattle, WA yesterday from an EMer. [...]. I think the love and admiration we have for Mr. Hinshaw is a result of his dedication, integrity, demeanor, and yes, sense of humor. Thanks, Mr. Hinshaw. Contribution from Mike Arnett (). 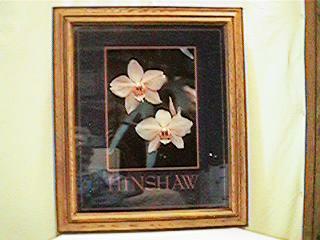 Laura Hinshaw photo sold on eBay Oct 3 2001.